Create & Maintain Healthy Skin for Life with ZO Skin Health! This amazing line of skincare products raises the bar by offering a serious skin care system that is effective and with no restriction on how long the products can be used. ZO Skin Health aims to treat the skin at every layer, with their wide range of products featuring antioxidants, retinol, and anti-inflammatories for producing the best results for your skin. Regardless of your skin type, age, gender or ethnicity, ZO Skin Health has a solution to help you achieve continuously healthy skin. 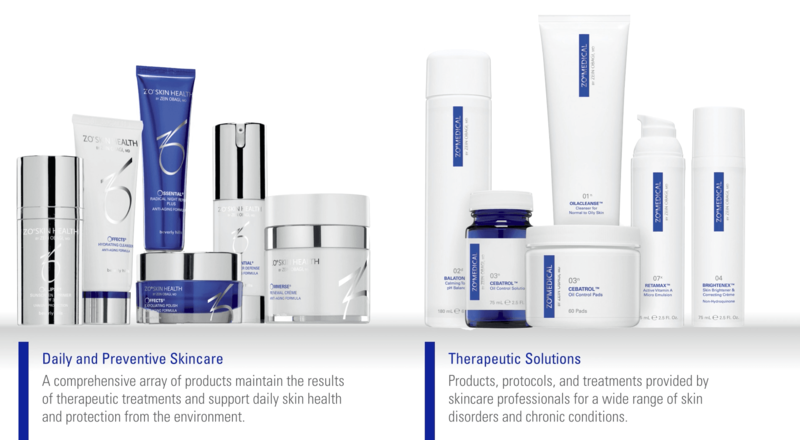 Featuring bioengineered complexes, exclusive formulations, advanced ingredients, and unique delivery systems and that offers solutions for a wide array of skin issues: from wrinkles, spots, and fine lines to enlarged pores, Melasma, acne, sun-damage, and more… ZO Skin Health is a game changer; the products are revolutionary and the results are like nothing else. Dr. Zein Obagi understands the science of skincare better than anyone, and his years of experience and expertise has revolutionized how we think and look at skincare. He created ZO Skin Health for daily and preventive skincare and the ZO Medical line for more therapeutic products that provide patients and physicians alike with the world’s most innovative and effective skin health solution. Ossential Instant Pore Refiner is great for achieving a matte-look and can give a more youthful appearance in as little as a week. It refines pores, minimizes shine, and smoothes skin texture, all-in-one! Oraser Cellulite Control Body Smoothing Cream helps to minimize the appearance of pesky cellulite and works all-around-the-clock! In fact, 77% of users reported a reduced appearance in their cellulite after 8 weeks! Ossential Growth Factor Serum Plus features a triple-action formula, perfect for those wanting to address anti-aging concerns with a single product: reduces lines & wrinkles, restores skin elasticity, and brightens complexions.